42mm 18K rose gold case, 10.64mm thick, with see-through sapphire crystal back, 18K rose gold crown screw down, sapphire crystal, silver dial with luminescent hands and Roman numerals, automatic movement with stop seconds, hours, minutes, seconds and date, approximately 60 hours of power reserve, 18K rose gold bracelet, 18K white gold folding buckle. Water resistant to 100 meters. 42mm stainless steel case, 10.64mm thick, with see-through sapphire crystal back, stainless steel crown screw down, sapphire crystal, silver dial with luminescent hands and Roman numerals, L.U.C 01.01-L automatic movement with stop seconds, hours, minutes, seconds and date, approximately 60 hours of power reserve, stainless steel bracelet, stainless steel folding buckle. Water resistant to 100 meters. 42mm stainless steel case, 10.64m thick, with see-through sapphire crystal back, stainless steel crown screw down, sapphire crystal, porcelain dial with luminescent hands and Roman numerals, L.U.C 01.01-L automatic movement with stop seconds, hours, minutes, seconds and date, approximately 60 hours of power reserve, stainless steel bracelet, stainless steel folding buckle. Water resistant to 100 meters. 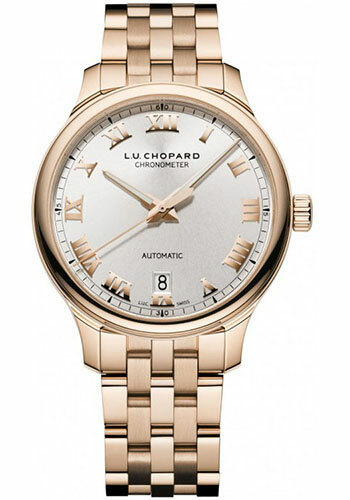 42mm 18K rose gold case, 10.64mm thick, with see-through sapphire crystal back, 18K rose gold crown screw down, sapphire crystal, silver dial with luminescent hands and Roman numerals, L.U.C 01.01-L automatic movement with stop seconds, hours, minutes, seconds and date, approximately 60 hours of power reserve, black alligator strap with hand sewn matching tones, 18K rose gold pin buckle. Water resistant to 100 meters. 42.00 mm stainless steel case, sapphire crystal back, grey dial, automatic self-winding L.U.C 01.01-L movement with hours, minutes, seconds, and date, approximately 60 hours of power reserve, hand-stitched black alligator strap. Water resistant to 100 meters. 42.00 mm stainless steel case, sapphire crystal back, white dial, automatic self-winding L.U.C 01.01-L movement with hours, minutes, seconds, and date, approximately 60 hours of power reserve, hand-stitched black alligator strap. Water resistant to 100 meters. 42.00 mm stainless steel case, sapphire crystal back, silver dial, automatic self-winding L.U.C 01.01-L movement with hours, minutes, seconds, and date, approximately 60 hours of power reserve, hand-stitched black alligator strap. Water resistant to 100 meters. 42mm stainless steel case, 10.64mm thick, with see-through sapphire crystal back, stainless steel crown screw down, sapphire crystal, silver dial with luminescent hands and Roman numerals, L.U.C 01.01-L automatic movement with stop seconds, hours, minutes, seconds and date, approximately 60 hours of power reserve, black alligator strap with hand sewn matching tones, stainless steel pin buckle. Water resistant to 100 meters. 42mm stainless steel case, 10.64mm thick, with see-through sapphire crystal back, stainless steel crown screw down, sapphire crystal, porcelain dial with luminescent hands and Roman numerals, L.U.C 01.01-L automatic movement with stop seconds, hours, minutes, seconds and date, approximately 60 hours of power reserve, black alligator strap with hand sewn matching tones, stainless steel pin buckle. Water resistant to 100 meters.